On 22 June, the Committee on Industry, Research and Energy of the European Parliament examined the draft revision of the Directive to promote the use of energy from renewable energy sources. The European Commission released an ambitious proposal aiming at decarbonizing the economy. 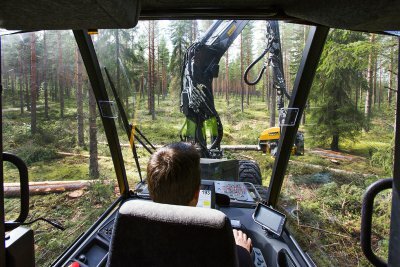 European forestry contractors are monitoring carefully the ongoing debates: while agreeing on the objectives, they are concerned by the political stances of some MEPs as regards the sustainability of biomass. The new draft will increase the ambitions for the use of renewable energy from 27% of total European energy consumption to 35%. "CEETTAR supports an increased use of renewable energy and we are convinced that biomass from European forests plays a significant role in achieving the overall EU target by 2030", says Claus Clemmensen CEETTAR's biomass expert. A stable political support for renewable energy is much needed to help the renewable energy sector to develop at the pace needed to reach the target in 2030. "Biomass for energy production plays a vital role in the entire forest sector, and since it is often a matter of long-term investment in the forest sector, it is incredibly important to be trusted in the political system." Claus Clemmensen continues. "We therefore wish from the EU, a clear and long-term declaration of the role of biomass in future energy supply." Less positive are the announcements made by MEP Bas Eickhout as regards the important question of sustainability of biomass for energy production. Forestry contractors are responsible stakeholders actively involved in the sustainable management of forests. Therefore, CEETTAR is concerned by his approach which overrides the fact that sustainable European forestry is already secured and documented through national and international legislation, as well as various voluntary certification schemes. "Biomass from the forest is an important part of future energy policy in the EU, and restrictions on the use of biomass will harm both sustainable forestry, but also affect thousands of forest contractors across Europe," says Claus Clemmensen. CEETTAR would like to see that in future biomass production, a risk based assessment of forest biomass is used. The assessment must be adapted to national legislation so that it does not give unnecessary administration. Since the beginning of 2016, Denmark has had a voluntary agreement between energy producers and biomass producers to ensure sustainability of biomass. A national risk assessment has been made, which provides all parties with easy access to current legislation, data from national forest monitoring and clear guidelines for where there is a risk of harming nature in the production of biomass. "However, we can observe that working with the risk-based approaches in Denmark has added additional administration and costs to forest owners and contractors, which is not desirable and we hope the system can be adapted when it has be used for a longer period of time, "says Claus Clemmensen. "We will keep an eye on developments in Denmark and assess if there is anything that can be used in the rest of Europe," he adds. CEETTAR will continue to actively contribute to the decision-making process in cooperation with other European stakeholders. The official position of the European Parliament is awaited after the summer break.